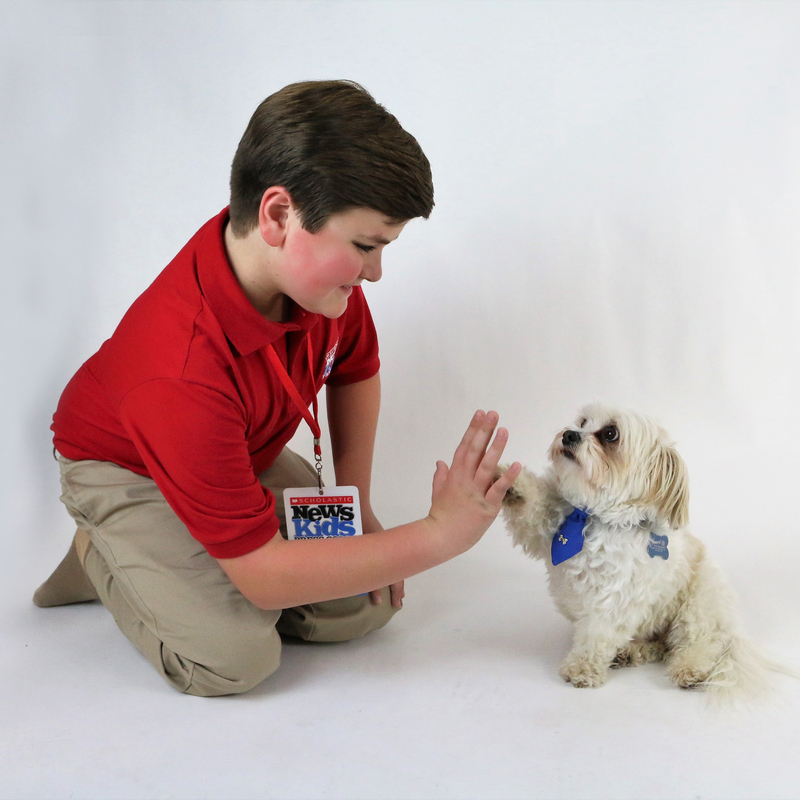 The Unlikely Rise of “Snowball” | Kid Reporters' Notebook | Scholastic Inc.
Snowball shows Nolan one of his many acting tricks. Snowball, a 6-year-old Shih Tzu Chihuahua mix, is not your average household pet. He is a professional dog actor and model. How did this adorable dog get his start? I recently met with Snowball and his owner, Jami Kinton, in Cleveland, Ohio, to find out more about Snowball’s background and day job. While Kinton was working as a reporter, she said, she met Snowball. She was on assignment and noticed the tiny dog wandering the streets. Snowball was malnourished and dirty. Kinton took him back to the newsroom and tried to find his owner. When no one came forward, she kept him. “He has been the greatest joy of my life,” Kinton said. Nolan visits with Snowball and his owner, Jami Kinton, at their home in Cleveland, Ohio. Kinton, who also works as a model, brought Snowball to the studio one day when more dogs were needed for a photo shoot. The photographers and directors complimented Snowball’s calm demeanor, which is rare for his breed. They encouraged Kinton to pursue an acting and modeling career for the pup. For the past 3 and ½ years, Snowball has enjoyed numerous opportunities as a canine celebrity. Snowball has several agents across the country who match him with jobs. Magazine and online advertisements, television commercials, and a new web series feature him. Occasionally, Kinton and Snowball work together as models on the same job. Snowball poses during a holiday photo shoot for a major online retailer. To train Snowball for acting roles, Kinton uses a clicker. When the dog performs the action being practiced, she presses the clicker. “Snowball knows the click means that he’s doing something correctly,” Kinton said. This enables him to learn a trick or an action in just a few hours. For a job well done, Snowball earns an edible treat, such as turkey jerky. Snowball often gets to travel for work. He prefers flying over driving. “I have a special dog carrier backpack that allows Snowball to stay with me in the cabin on the flight,” Kinton said. When Snowball sees the backpack, he knows it’s time to go to work and be a star. Nolan poses with Snowball during the dog’s break from a photo shoot.